The web hosting service is allows organizations and individuals to host a website or web page onto the Internet. A website designer designs a website with the help of coding and graphics of images for businesses. Those website or webpage need hosting space to be viewed in the Internet. Websites are hosted, or stored, on special computers called servers. When Internet users want to view your website, all they need to do is type your website address or domain into their browser. Their computer will then connect to web hosting server and your web pages will be delivered to them through the browser. We Offer Web Hosting in India. Mainly there are 4 types of web hosting and their many sub components types like cloud hosting, hybrid hosting, multi hosting etc. We offer most frequently usable shared hosting, reseller hosting, VPS Hosting Dedicated Servers and managed WordPress hosting in India. Shared web hosting is the most common type and maximum use in India, where we host multiple sites on a single server, all site share the servers resources like disk space, RAM, and bandwidth. 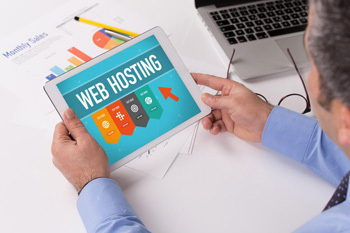 Normally Shared hosting is a great option for those looking for affordable web hosting, it’s simple and requires no advanced knowledge to manage the control panel, we also offer free video tutorials, and provide cPanel as a control panel. The biggest concerns are that shared hosting can’t handle high traffic to a site. Shared hosting is a great option for small businesses or businesses on a budget. Our shared hosting service support the most common CMSs like WordPress, Joomla, Drupal, etc. Reseller Hosting is a resell able of web hosting where the user has an allotted amount of hard disk space and bandwidth that can be used by a end users to host websites. The reseller will usually buy the space in wholesale price and then resell it to potential customers individually. This is another option that provides flexibility and it is also more affordable. The web host does the technical stuff for you and you can focus on customer support. VPS hosting means virtual private server, so VPS hosting behave like a dedicated server within a shared hosting environment. Technically, it can be used as a combination of dedicated server hosting and shared hosting. Since it’s not a full dedicated server, it is less expensive compare to dedicated servers. It’s also customizable and hosting plans are usually easily scaleable with us. The biggest drawback is that it’s more expensive than shared hosting but you are getting more features and flexibility with it. Currently we offer un-managed VPS servers in India. Managed WordPress Hosting is different from other hosting because it is a managed service. All of the technical aspects are controlled by the Global i web solution, which only focuses on WP sites. The aspects we control include scalability, website uptime, weekly backups, WordPress updates, speed, and security updates. The amount of control is really important what makes both the pros and cons of managed wp hosting. It’s great if you’re flexible with less control (but awesome security , speed, and support), which many up starting companies are, but, if you’re a bigger business we will suggest you to go with VPS or Dedicated servers. Dedicated server hosting is a highest type of hosting in terms of configuration that is dedicated to a single website or a single purpose. A single dedicated server is allocated to a single user it’s not available to multiple clients, like shared hosting, it can handle high traffic. It’s most flexible, has high performance, and is reliable. You have to manage your server from yourself.